The Ohio State University Chadwick Arboretum harbors some exceptional plant collections. Among my favorites is the hardy bamboo collection. While not an exhaustive collection bamboo taxa that are hardy in Ohio, the unique setting of the collection, and dedication of the area to nothing but bamboo, lend it an other-worldly feel that provides a much needed respite from the urban grind of the OSU campus. Surrounded on all sides by pavement and walls, this unassuming bamboo garden serves as a model for other urban gardens and is an ideal use of this difficult planting site. Two of my personal favorites can be found at the entrance. Shibataea kumasaca, the ruscus-leaf bamboo (referencing the resemblance of the foliage to the genus Ruscus, the butcher's broom). This resplendent clump is still green and lush in December; the product of a very rainy spring and summer in central Ohio. A curious and problematic feature of this plant is that in dry years it will develop severe chlorosis. I have seen it in other regions of the U.S. and it definitely prefers a more strongly acidic soil. A close-up of Shibataea kumasaca. Browning of the foliage is characteristic of this species. 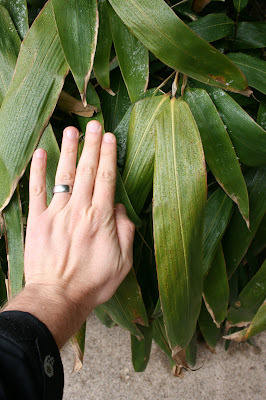 Sasa sennanensis is closely related to our native Arundinaria gigantea, the cane-break. I have grown this species in the past and find it to be hardy and durable. The more moisture it gets, the taller it will grow. In dry years, it will be shorter. Another view of the garden. Note the two Pleioblastus selections in the center.The shorter of the two is Pleioblastus pymaeus var. distichus 'Wooster Dwarf',and the taller is labeled as Pleioblastus viridostriatus both are well-known for being embarrassingly aggressive in garden settings and they are best planted where they are surrounded by pavement on all sides, such as parking lot islands. This lush and exotic looking bamboo is Indocalamus tessellatus. It is one of the least aggressive species in the garden and is likely at the edge of it's cold hardiness range. Despite this it is a highly desirable garden plant.